It’s been a while since I submitted a picture to I Heart Faces. 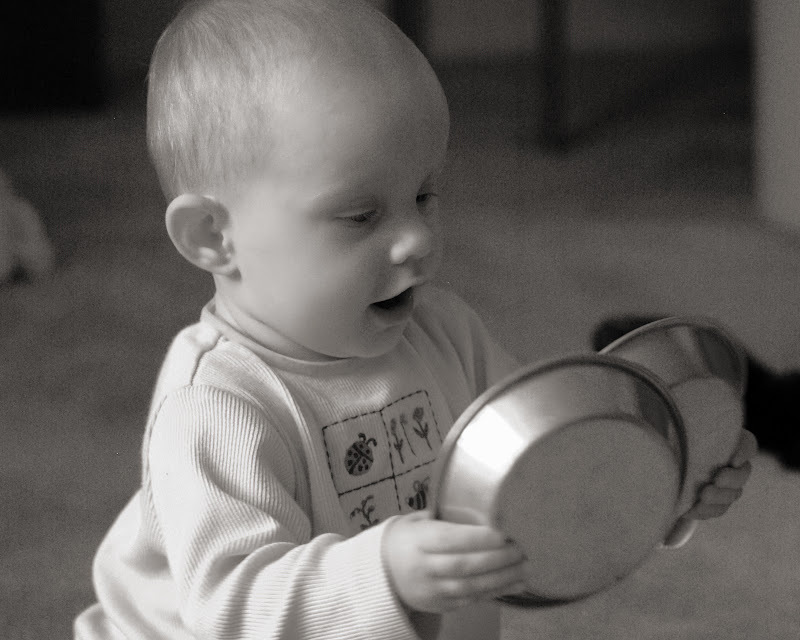 This week’s theme is “Completely Candid,” and it fits perfectly with my new favorite shot — Savannah playing with some old pans that were my toys as a child. I love family traditions. When I was a child, my family took a vacation together every summer, and we visited grandparents every year at Thanksgiving and Christmas. The format was predictable but the adventures were fresh and exciting every time. The Professor and I are homebodies more than my parents were. So as you would expect, our traditions are different — maybe a little less glamorous than a trip out West, but every bit as special. Case in point: This week corn went on sale at every grocery store in our county. So for the third September since we’ve been married, we came back with ten ears of corn and made Ina Garten’s delightful cheddar corn chowder (more appropriately described as Gain Back Your Pregnancy Weight Soup). September is a great time to get fresh corn, and the soup is a comforting reminder that autumn is on the way. If we had this soup regularly, I wouldn’t consider using half-and-half or a whole block of cheese or most of a slab of bacon in it. But for a once-a-year feast, we look the other way as we pour in the last few ingredients. As I make plans to homeschool Savannah, one of the things that has appealed to me from (gasp) a method other than Charlotte Mason or classical has been the Waldorf idea of seasonal rhythms. I want to teach Savannah to experience each season fully — to shower herself in the summer sun, to jump in piles of many-colored autumn leaves, to tumble in the snow of winter, and to learn the cheerful songs of the birds in spring. I also want our family to have traditions that celebrate the rhythm of the year. Corn chowder in September. Apple-picking in October. Turkey in November. Christmas cookies in December. All the year round. There are books that have great ideas for seasonal traditions , but don’t you think it’s more fun to come up with your own? “You’re going to post to the Blog? I thought the Blog was dead… You’re going to revive it?” — The Professor.